See, we started with my Chicken Hot Pot NOT Pot Pie recipe from last year (potatoes instead of pie crust). But then we realized we didn’t have chicken at the campsite. So, we used some shredded plain pork roast instead. It was very yummy! 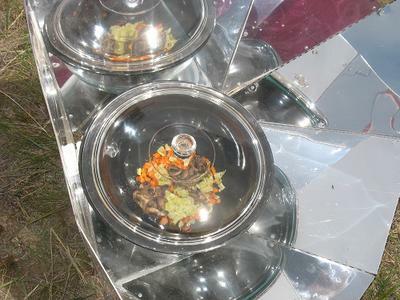 We did a double batch using our two Solar Hot Pots, and with our growing children, we ate almost all of it! Also did more leftovers one day, Shredded Sunshine Chicken for lunch another day followed by more leftovers for supper the same day, and some chocolate fondue another day. FUN!!! And wonderful for our cooking needs right now.